Now I saw in my dream, that Christian went not forth alone, for there was one whose name was Hopeful (being made so by the beholding of Christian and Faithful in their words and behavior, in their sufferings at the fair), who joined himself unto him, and, entering into a brotherly covenant, told him that he would be his companion. Thus, one died to bear testimony to the truth, and another rises out of his ashes, to be a companion with Christian in his pilgrimage. This Hopeful also told Christian, that there were many more of the men in the fair, that would take their time and follow after. Before entering the town of Vanity, Christian and Faithful were warned that one of them would lose his life for the sake of gospel. They were aware of the danger, but they entered willingly, believing that Christ and the souls of those in the town were of more value than their own comfort, or even their own lives. In the end, it was Faithful who died bearing witness to the truth of the gospel. Faithful completed his journey and went on to his reward. Now Christian is left to press on without him. But Christian is not left to walk alone in sorrow. 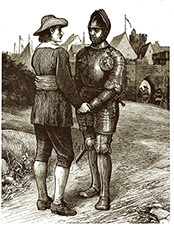 Hopeful has become a pilgrim and he tells Christian that he will be his companion. 1. The journey is more pleasant if we do not walk alone. Earlier in the story Christian discovered the value of Christian fellowship when he caught up with Faithful. Now, in God’s kindness, Christian once again has a companion to walk with him. Walking with other believers on the journey is a great encouragement. Their labors in the gospel build up our labors. Their faith strengthens our faith. Their prayers increase our own prayers. Seeing God’s work of grace in others gives us strength and hope. Paul often mentioned and gave thanks for fellow-labors. We give thanks to God always for you all, making mention of you in our prayers, remembering without ceasing your work of faith, labor of love, and patience of hope in our Lord Jesus Christ in the sight of our God and Father (1 Thessalonians 1:2–3). Greet Priscilla and Aquila, my fellow workers in Christ Jesus, who risked their own necks for my life, to whom not only I give thanks, but also all the churches of the Gentiles (Romans 16:3–4). I thank my God upon every remembrance of you, always in every prayer of mine making request for you all with joy, for your fellowship in the gospel from the first day until now (Philippians 1:3–5). It is a great joy to have brothers and sisters in Christ, with whom we covenant together in the church, to walk and labor together in the hope of the gospel. 2. Pressing on in hope is rooted in seeing the work of God’s grace. It is significant that Christian’s new companion is named Hopeful. God is a God of hope, who by the power of His Spirit, fills us with hope. God sent His Son, the Lord Jesus, that “in Him the Gentiles shall hope” (Romans 15:12). He “according to His abundant mercy has begotten us again to a living hope through the resurrection of Jesus Christ from the dead” (1 Peter 1:3). Hopeful is new believer—his heart, a fresh work of God’s grace. His life is a testimony to the power of God’s transforming grace. God was at work, even in the midst of concerted efforts to suppress and silence the gospel. Hopeful was rescued from Vanity. And Hopeful himself has hope that the darkness of the town of Vanity can be overcome. He is sure that many others from the fair will in time follow and join them in their pilgrimage. 3. Our lives are ever on display before a watching world. We don’t know how God may use our lives to influence and intrigue others around us for the sake of the gospel. Our joys and trials, and especially how we respond to joys and trials, can be of great consequence when brought to the attention of others in the purposeful designs of God’s providence. Hopeful came to faith in Christ by “the beholding of Christian and Faithful in their words and behavior” and Bunyan adds for emphasis “in their sufferings at the fair.” It was especially in their endurance through suffering that Christian and Faithful demonstrated the true value and veracity of the gospel. Christ is a treasure worth more than all this world can offer—a treasure worth more than even life itself. We live the gospel before others and share the gospel with others—our friends, family, children, neighbors, coworkers, even strangers — “that they may set their hope in God” (Psalm 78:7). Consider your own life. We live in a vain world. What do those around you see in the “beholding” of your life? Do you live in a way that commends the gospel? Do you demonstrate by choices, actions, attitudes, and reactions that Christ is your greatest treasure, and that the souls of people around you are precious? May God grant us to walk with hope that we might walk worthy of the gospel of Christ.